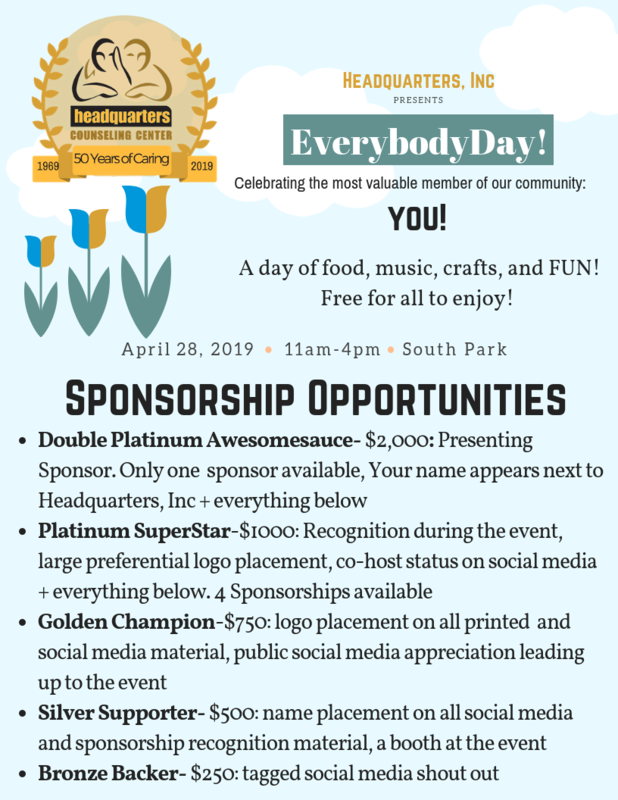 The annual day of fun benefiting Headquarters, Inc.
Everybody Day celebrates the most important member of our community: YOU! It's a day of music, activities, food, and FUN! Events, food, and activities will be free for the public. 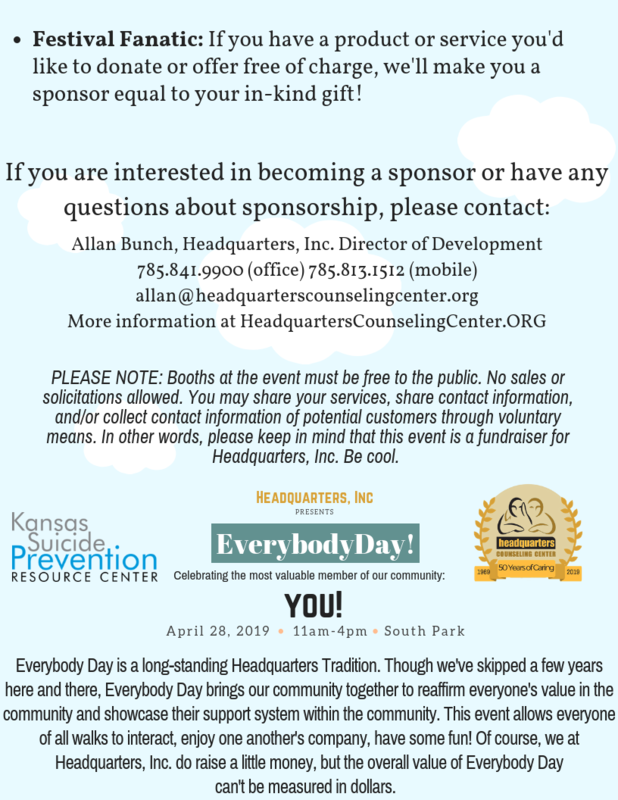 We will have craft, art, and bake sale tables at the event with all kinds of fun things for sale made by Headquarters Counseling Center volunteers, staff, and members of the community. Sponsorship means that Everybody Day is free for everyone to attend and enjoy--and we want to make sure the public knows that you supported it. Our sponsorship packages ensure that we'll share the love. Everybody Day is a long-standing Headquarters Tradition. Though we've skipped a few years here and there, Everybody Day brings our community together to reaffirm everyone's value in the community and showcase their support system within the community. This event allows everyone of all walks to interact, enjoy one another's company, have some fun! Of course, we at Headquarters, Inc. do raise a little money, but the overall value of Everybody Day can't be measured in dollars. PLEASE NOTE: Booths at the event must be free to the public. No sales or solicitations allowed. You may share your services, share contact information, and/or collect contact information of potential customers through voluntary means. In other words, please keep in mind that this event is a fundraiser for Headquarters, Inc. Be cool. YOU can also support Everybody Day as an individual--Just make a donation! Your donation helps support our mission to keep the event free for everyone to enjoy! It buys food, set-up equipment, and activities that weren't donated. If you'd prefer to sponsor via cash or check, please contact us directly.